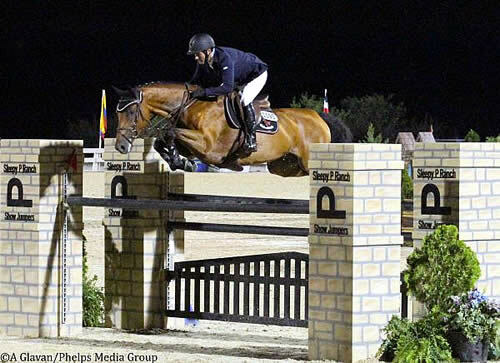 Pablo Barrios and Antares soar to victory. Lexington, KY – August 15, 2014 – Who ever said lightning never strikes the same place twice has not met Pablo Barrios. The Venezuelan rider once again piloted Antares to the top of the pack in the $25,000 Hagyard Lexington Classic presented by Zoetis, mimicking his effort two weeks prior in the $50,000 Kentucky Summer Grand Prix. The win comes just in time for Barrios to add to his stockpile of points for the Hagyard Leading Rider Bonus before he jets off to Normandy for the World Equestrian Games. The $50,000 bonus is given to the rider accumulating the most points throughout the Hagyard Challenge Series, a summer-long set of seven show jumping events at the Kentucky Horse Park in Lexington. Friday night’s prix marks the fifth class in the series. That’s an understatement. Barrios has more than twice the number of points as the next closest rider, and he has earned them on a number of different horses, Antares being his most recent victor. The 9-year-old bay gelding is getting ready to compete in the WEG with Barrios, and looks to be in fine form. Barrios is not kidding when he says the big gelding is quick and agile. Thirteen horses jumped clean over the Allen Rheinheimer designed course, and Antares went early in the jump off with plenty of speed horses behind him, including second place finisher Ramiro Quintana on Caramello Z. Barrios shaved seconds off his time by taking an inside turn coming out of a one stride combination to a vertical before galloping for the finish over the Hagyard fence. “He’s so clever,” Barrios said of Antares. “I mean when I turned to that vertical after the in and out, I found the vertical at the last minute after the inside turn, and he just pats the ground and jumps beautiful. In sharp contrast to Barrios’ big horse was second place finisher Ramiro Quintana’s mount Caramello Z. The short and spicy 9-year-old mare missed the winning time in the jump off by fractions of a second. Quintana is pretty confident he could have outpaced Barrios and Antares, but a momentary lapse in focus cost him in the jump off. “I was planning on doing six strides one to two,” Quintana said of his jump off plan, “but I had a hard rub at the second fence, and after that it was an inside turn. I lost my concentration for a second because I was listening to hear if the pole was coming down. Speaking of the horseshoe jump, the fence Quintana is referencing caught a fair number of horses and riders off-guard in Friday’s class, collecting more than its share of rails and refusals. Designed and built by Steve Stephens, the uniquely shaped jump was used earlier in the day in the first round of the USHJA International Hunter Derby Finals, and both Quintana and Barrios admit they made an error in how they approached it with their first mounts in the class. “It’s not a fence we’re used to jumping, but I made a mistake with my first horse and with Antares to go show them that fence,” Barrios said. Both he and Quintana let their horses halt and sniff at the fence prior to starting the course. Quintana is in agreement on both the challenge of the fence and how to address it, though he learned the hard way. He rode Versus before Caramello Z in the first round, and chose not to continue on Versus after running thorough the top rails of the horseshoe fence. “I had a lot of problems there with my first horse; he spooked really hard there,” Quintana said. “When I went in with Caramello Z, I didn’t even show it to her. With my first horse I went in and I showed it to him and it almost spooked the horse even more. Hagyard Equine Medical Institute is one of the oldest and largest equine veterinary practices in the world. Founded in 1876, the institute offers a staff with qualifications unparalleled by any single non-university veterinary group in the equine industry, and Hagyard veterinarians have dedicated themselves to the health and wellbeing of the horse for more than 130 years. The facility at Hagyard Equine Medical Institute offers 13 Digital Radiology systems, 1.5 Tesla Siemens MRI, Nuclear Scintigraphy, a high speed treadmill, an on-site laboratory, an on-site pharmacy, full surgical services, 24-hour emergency services and Hyperbaric Medicine. The institute has practiced veterinary medicine for more than 133 years and is currently composed of over 60 experienced veterinarians, with 12 board certifications in specialty areas of Medicine, Surgery, Critical Care, and Theriogenology.